Traffic and development continue to dominate the Malibu election discussion. "One of the problems I always have with city council elections is that there are truly not many issues on the table. I don’t think there is anyone in Malibu that endorses rampant development nor can I ever remember anyone advocating it. Of course, what I might call normal expansion, you might call rampant development." One reason we haven't seen rampant development in the Civic Center area is because there have been too many constraints to overcome. Many local activists have expressed the concern that the city's new wastewater treatment plant will soon remove developers' biggest obstacle. 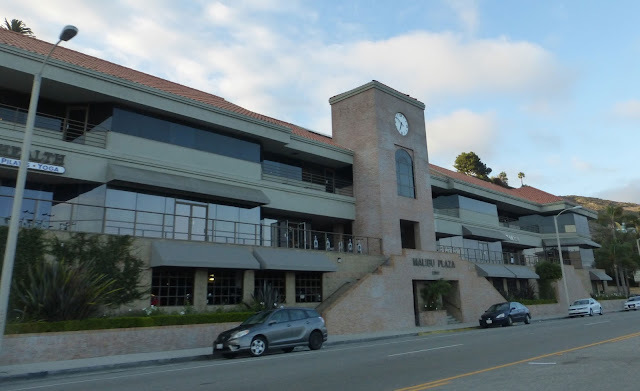 This is an official City of Malibu map of past and future development in the Malibu Civic Center area. M is for sale, O sold last year, the owners of S and L sued the city over Measure R, and Q is already approved to become a 110,000-square-foot shopping center. These properties represent a lot of potential change for a small area. Another reason is that the impact of development is cumulative. Unless there's a massive project that brings large numbers of the community together in opposition, bit by bit development—often described as "piecemealing," can go unnoticed. A setback variance here, a height variance there, and before anyone realizes what's happened we find ourselves with the Great Wall of Malibu instead of a view of the coast. It's hard to know when it happened. 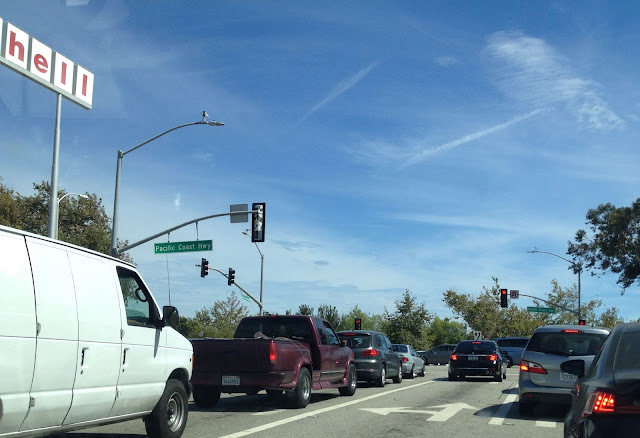 One day the open space is there, the next it isn't. 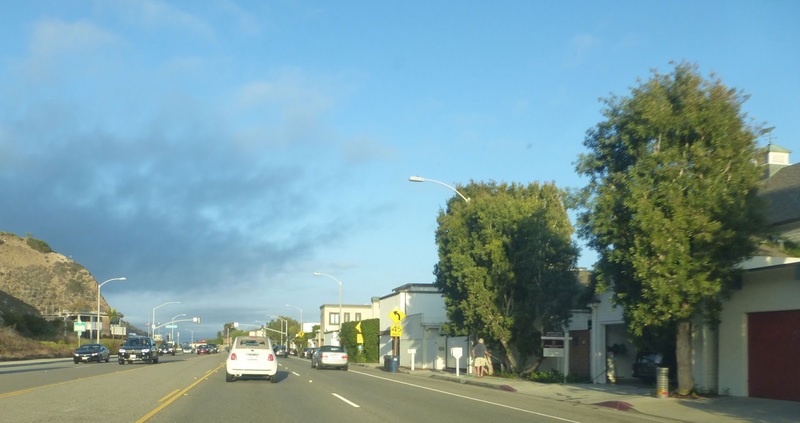 Along large stretches of Pacific Coast Highway in Malibu development is so dense one would never know the ocean is right on the other side of the road. The situation is somewhat better on the western end of town, but the proliferation of massive landscape plantings, like ficus hedges, block the view as efficiently as eastern Malibu's garage doors and massive houses. It seems to be an unspoken law of the universe that once a city is established it seeks to grow. Cities have planning departments not conservation departments, and planners have much in common with hair stylists—always trying to give you a cutting edge (so to speak) haircut when all you want is the ends trimmed. However, hair grows back, the environment doesn’t. 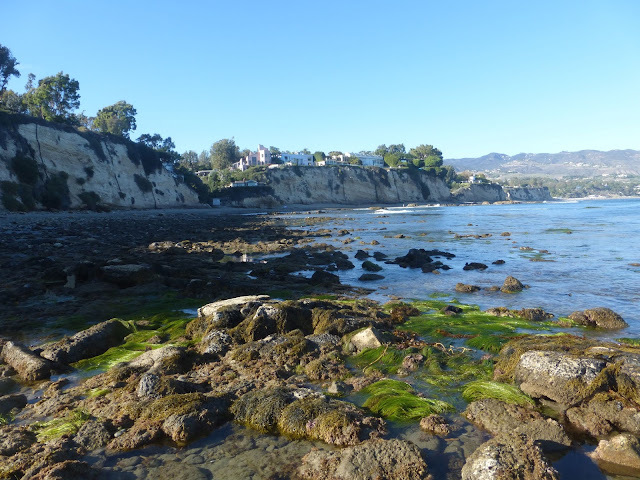 And the burden of environmental oversight in Malibu has remained the responsibility of the citizens, as the city officials wield their metaphorical scissors in what often seems a determined effort to give Malibu the planner's version of a mullet. If all one had to go on was the strip of Malibu that lines PCH one would not give these "27 miles of scenic beauty" a second glance. 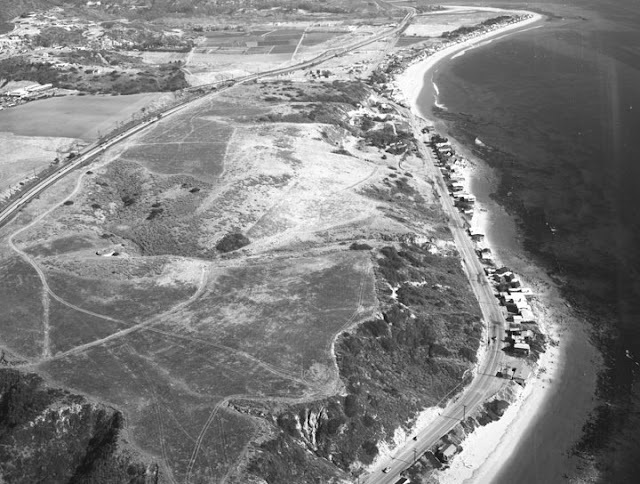 This 1950 aerial photo of Malibu Road from the collection of the Los Angeles Public Library shows modest houses and long stretches of open shoreline. Today, the same stretch of coast is wall-to-wall houses. Every time a permit is issued for a rebuild, the replacement house is bigger than the one it replaced, as developers attempt to push the limits of the city's building codes to the breaking point. 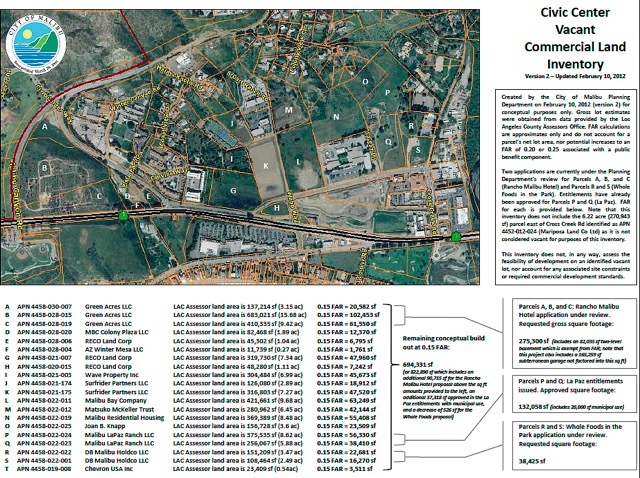 Yes, property owners have rights, but the city has a responsibility, too, not just to ensure that plans meet code requirements but that they comply fully with local coastal planning requirements WITHOUT excessive variances. That wall of houses leaves little room for the actual beach. 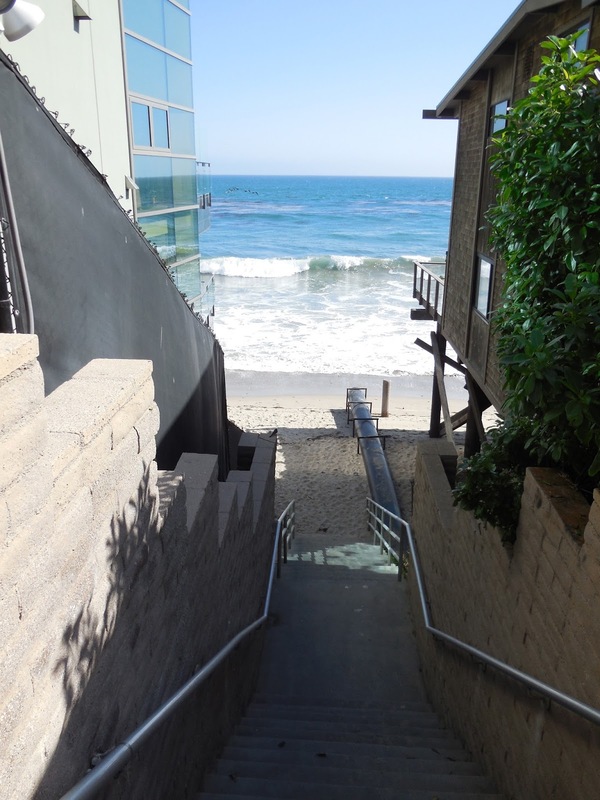 Visitors who navigate their way to east Malibu beach accessways get to enjoy a patch of perpetually damp sand under a row of majestically cantilevered decks. Oh look! A public beach accessway! Alas, the illusion that the stairway leads to the splendors of nature is rapidly dispelled. You do, however, get to enjoy a worm's eye view of the underneath of other people's houses. That monster in the distance was under construction when I took this photo. It replaced a modest house that did not intrude dramatically into the ocean. Here's a closer look. 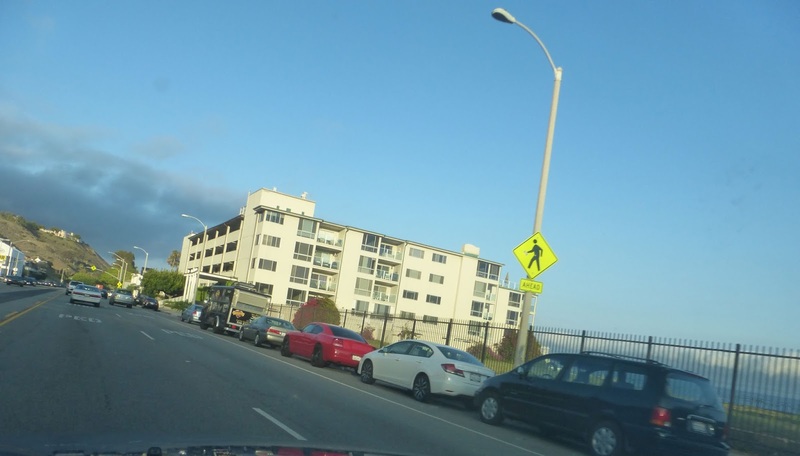 Pacific Coast Highway turned into a wall of stucco one project at a time. 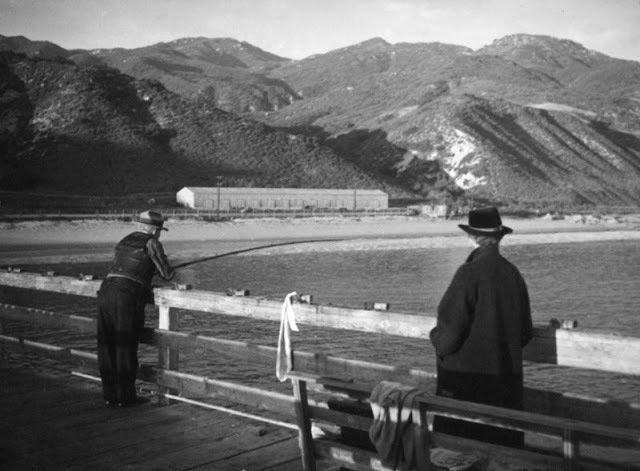 This is the same view in the 1940s. The long white building was the shed for the Ridge railroad. Grassroots efforts have curtailed many major Malibu projects, ranging from the marina and the freeway, to the county's plans for a city of 200,000, but residents just don't have the resources to go up against every cash grab proposed by shortsighted development interests. Property owners have the right to develop their property, but they aren't entitled to excessive variances that allow them to impinge on public views and key environmental resources, and that sense of entitlement is something that has been overly relied on for decades. The main objection to the so-called "Whole Foods in the Park" shopping center development was the number of variances granted to the developer, including the infamous vertical landscaping in place of open space. As projects emerge for new Civic Center development will the variances for height and density granted earlier developers end up becoming expected entitlements? The Malibu Bay Company's "76,000-square-foot "Sycamore Village" is planned for the property on the corner of Stuart Ranch Road and Civic Center Way. The 110,000 square-foot La Paz shopping center already has its permits. The 3.5-acre Knapp property sold last year. It can support 23,000 square feet of development and isn't subject to Measure R. The 6.5-acre Ioki property, next to city hall, is currently on the market and could be developed with up to 42,000 square feet. Change is coming. 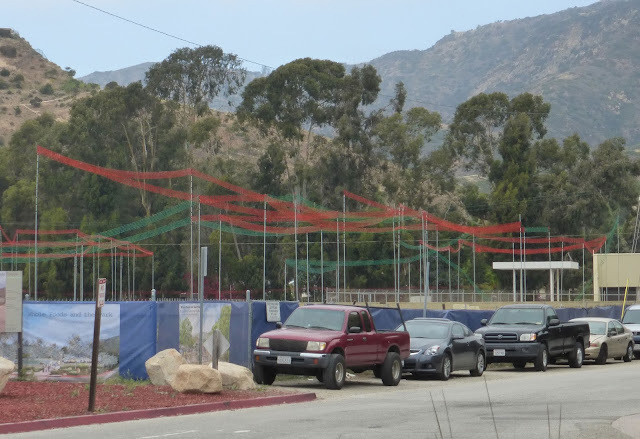 Will this part of the community ultimately end up looking like an extension of Malibu's Great Wall? Are we going to end up with more of this? This monster was forced through right before cityhood in the late 1980s. It's a prime example of what Malibu shouldn't be, but that doesn't stop developers from dreaming up similar projects. Where did this thing come from and why did anyone think it was a good idea? The county isn't to blame for this one—it cropped up recently. When I was small child my dad used to take me to to buy African violets here for Mother's Day. It was Bowman Nursery back then, a private house with a greenhouse behind it where hundreds of flowers grew in neat purple and pink profusion. It changed from a small empty house to a giant empty office building seemingly overnight. It's a double shame, since it is right next door to the Malibu Synagogue and Jewish Center, a beautiful building that is designed to blend into the landscape. Or can we maintain the qualities described in the city's Mission Statement that make Malibu a "unique land and marine environment and residential community" ? 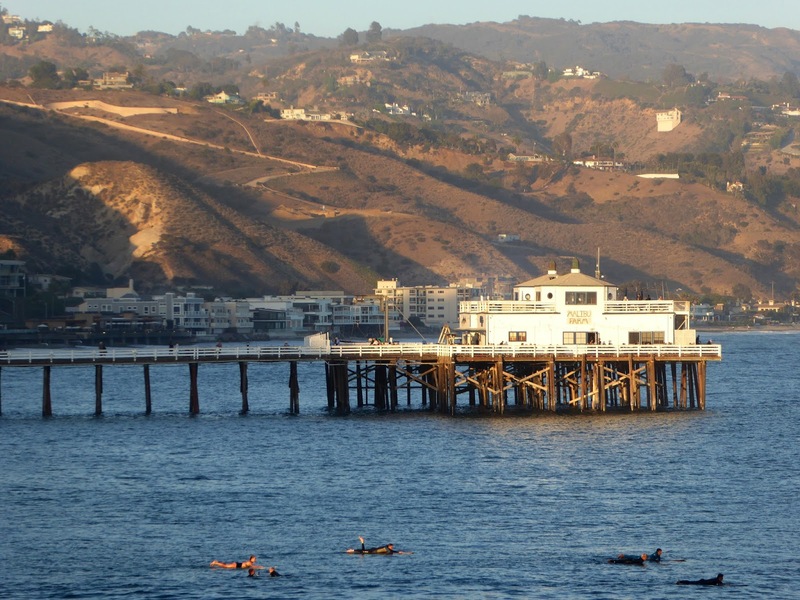 Once one escapes from Pacific Coast Highway, Malibu really is 27 miles of scenic beauty, or at least maybe 19 miles of scenic beauty and seven or eight of obnoxious beach houses and commercial development. 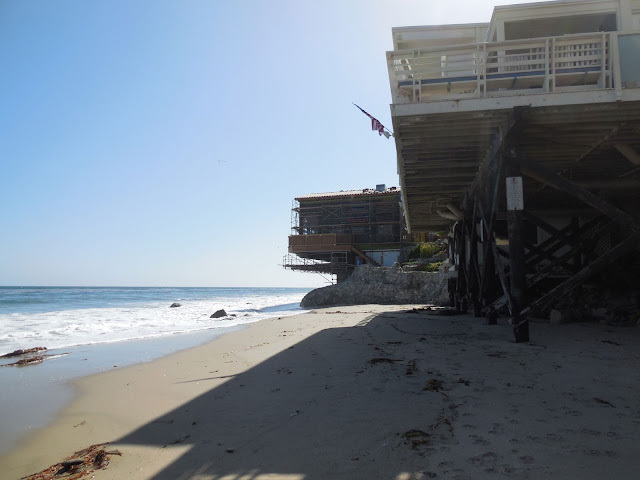 The two biggest challenges for Malibu moving forward will be to prevent "infilling," or changes to the city's zoning that permit higher density development and out of scale overdevelopment, and finding ways to retire commercial property and maintain open space. Maybe the question we should be asking this year's city council candidates isn't what they stand for but what they have stood against. That's the last empty lot on PCH in eastern Malibu, the last glimpse of ocean and horizon. 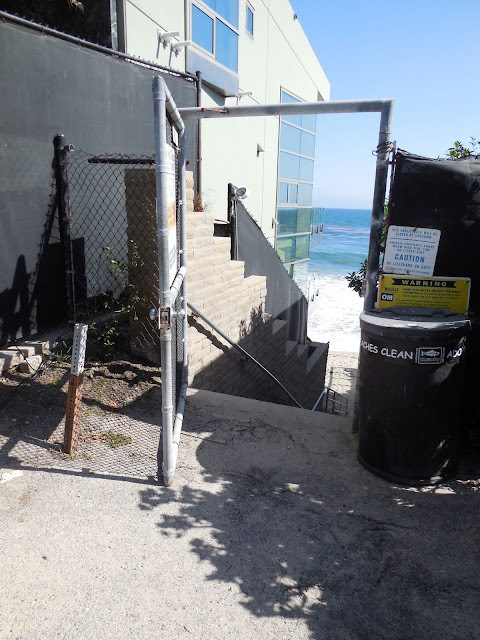 Is it destined to become another section of the Great Wall, or are there other alternatives for Malibu's future?